Throughout the Bible, God teaches the importance of remembering. In Joshua chapter 4, we read about God's instruction to set up memorial stones after He had dried up the Jordan River so that the Israelites could cross over into the Promised Land. After their circumcision in Joshua 5, the Israelites celebrated the Passover, possibly for the first time since they had left Egypt. Just as He did with the circumcision, God provided protection for His people so that they could obey His commands. Though they were still in enemy territory, they were able to observe the Passover in peace. When we read over miracle after miracle in the Bible, sometimes it can be easy to take for granted the Lord's amazing displays of sovereignty and provision. Although the Israelites had to wander in the desert for 40 years and one whole generation did not get to enter into the Promised Land because of their disobedience, God still fulfilled His promise. Joshua 5:10 says that the children of Israel kept the Passover on the fourteenth day of the month, which my Nelson Study Bible notes was four days after they had crossed over the Jordan River. I am amazed that despite the Israelites' sin during their wilderness wandering, despite the lengthy timeline that could have been shorter if they had been obedient, the Lord still provided for them in the wilderness and then brought them into the Promised Land in such perfect timing (Exodus 12:6) that it was exactly the right time to observe the Passover. Though we sin and wander and experience the consequences for our sin, God still provides and fulfills His promises to us, down to the last detail. When we have blown it, may we repent and trust in his grace and sovereignty as He continues to lead us on the journey He ordains. After the Passover observance, Joshua 5:12 says that the manna (the food God miraculously provided for the Israelites while they were in the wilderness) ceased and they ate the food of the land of Canaan (the Promised Land). God makes special provision for us when we are in wilderness seasons. Though we may be tempted to hold ourselves to an impossible standard when we simply do not have that much to give, the Lord is intimately acquainted with our spiritual, mental, emotional, and physical capacity at any given time and provides for us accordingly. He is not limited by our weakness or lack of resources. However, having experienced the miraculous provision of the Lord during wilderness seasons, we can easily become overly attached to the miracle instead of the Provider, Himself. Early in my pregnancy with my first daughter, the doctor told me that I was having a miscarriage. I was scheduled to have surgery on a Friday morning. As I was in the midst of my grief, the doctor's office called me in Thursday afternoon for one last sonogram, which revealed my daughter, miraculously alive and growing. When she was born, other circumstances that were unknown until the doctor was in the midst of performing a c-secion (because she was breech) meant that the baby and I could both have been in danger if I had not had a c-section. So much about my daughter's development and birth was so miraculous, I remember wondering if the next baby could possibly seem to be as much of a miracle. My next pregnancy ended in miscarriage and was accompanied by some unexplained health problems that required emergency surgery and a chemo drug. It was a long, difficult process. When I became pregnant again, it occurred to me that the miracle this time would be if I had a normal, healthy pregnancy and birth experience, which is exactly what the Lord provided. I had become so attached to the miracle of the first pregnancy, I had failed to realize that sometimes the miracle looks like ordinary, every day provision, which is just as much from God as the miracles are. I love the explanation from the Expositor's Bible Commentary by Frank E. Gaebelein, "In the providence of God, extraordinary means are only temporary. 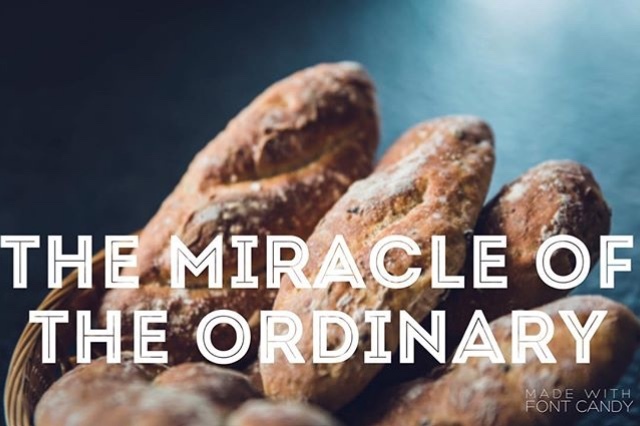 Now the Israelites would experience the miracle of regular harvests in the land of milk and honey...Jesus' miracles were evidence of God's presence and were not intended to be regular sustenance." Praise God that in His wisdom, He knows when we need extraordinary provision and when we need the miracle of ordinary! As children of God, when we see firsthand the miracle of His unfailing provision, may we fall more in love with the Provider rather than His provision. His provision, like everything else, stems from His great love for us. How true that sometimes we gloss over miracles because they look like ordinary things! What a good reminder to keep our eyes open! Never thought of it that way. Thanks for the special insight. The miracle of every day is something I don't often think about. This was great!